The stripes on the Palm Squirrels back are explained by a Hindu legend. The legend has it that a squirrel helped in the construction of the Adi sethu (bridge) at Rameswaram. The bridge was being constructed by Lord Rama and the Vanara Sena, and the squirrel played its part by rolling in beach sand then running to the bridge to shake the sand from its back, all the time chanting Lord Rama's name. Lord Rama was pleased by the creature's dedication and, in stroking the squirrel's back, the mark of Rama's fingers was left on the squirrel ever since. 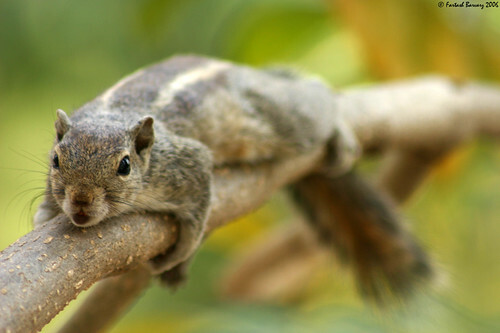 This association with Lord Rama explains why squirrels are considered sacred in India.